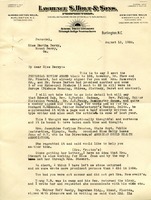 Martha writes to Lt. Commander Sousa about visiting the Berry School while he is in Rome on October 29th, they would be happy to furnish transportation for him and any member of his organization. She also encloses literature with the letter about the Berry Schools.